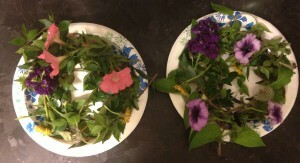 Growing up in my family, our Easter tradition was to make an Easter nest out of fresh flowers, preferably wildflowers. I’m assuming it is a German tradition, but I will have to get back to you on that. It was fun! We would go out the Saturday before Easter and make our little Easter nest and then the next morning the Easter bunny would bring our goods. We also dyed eggs and hunted them, but everyone does that. Here are Katherine and Nicholas’ Easter nests from last year. Since we stayed in Dallas last year we had to improvise a bit with the flowers, but it worked. As a kid our nests were full of wildflowers and so pretty. Do you have a fun Easter tradition in your family?